Thanksgiving is a time of year to reflect on gratitude and giving. As we’ve been learning about the first Thanksgiving in America, kids really took note of how much the Native Americans helped the pilgrims. This was especially noted in how they taught them how to grow and harvest their own food. We learned Indian Corn, also called flint corn or variegated corn, was a big part of that first harvest. 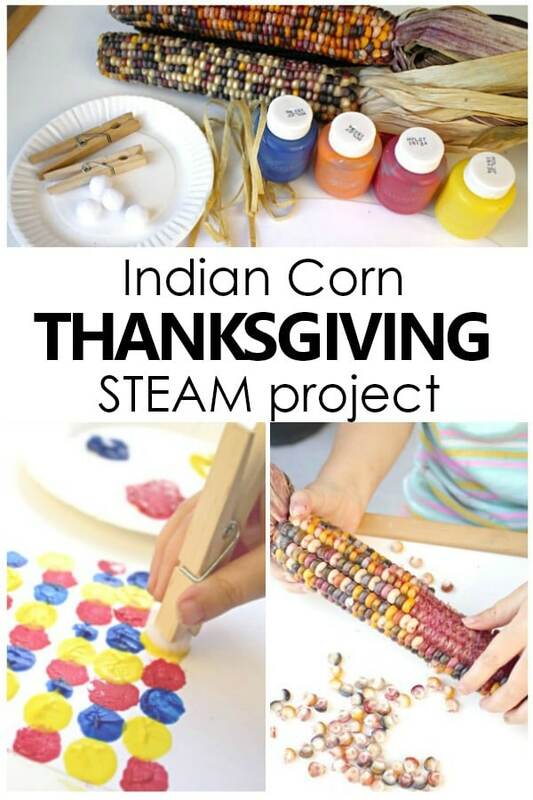 We’ve explored Indian Corn in the past and have had so much fun incorporating it into our fall and Thanksgiving learning themes that we decided to create a cross-curricular Indian Corn Math and Art Thanksgiving Project. 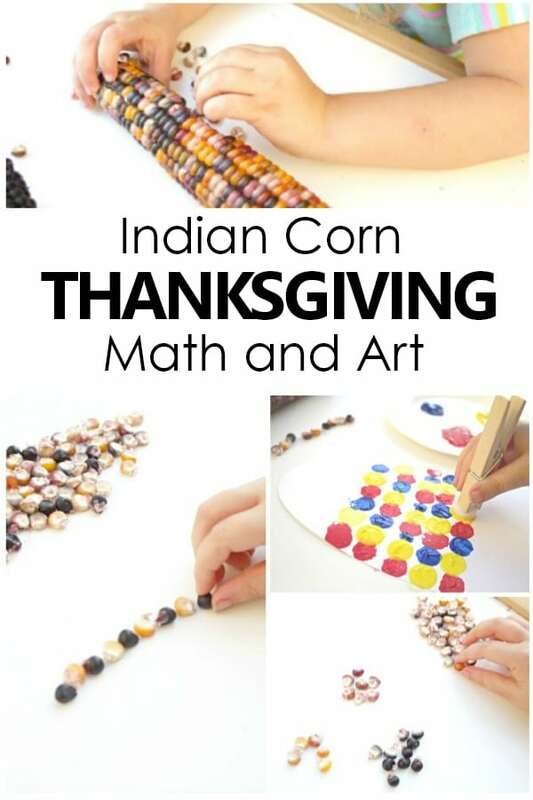 This investigative Indian corn math and art will have kids flexing their fine motor muscles, sorting and creating patterns, and finishing it all off with a beautiful Indian corn work of art. 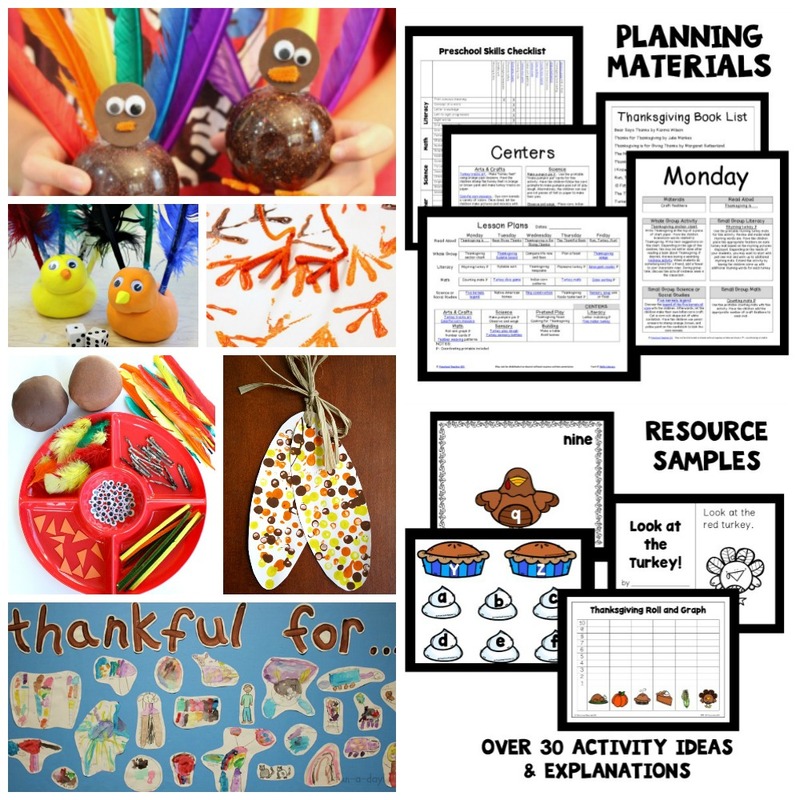 GET A FULL WEEK OF THANKSGIVING THEME ACTIVITIES IN OUR PRINTABLE PRESCHOOL LESSON PLANS. You can typically find Indian Corn in your local grocery store around fall and Thanksgiving. It keeps well and should last you throughout the season. 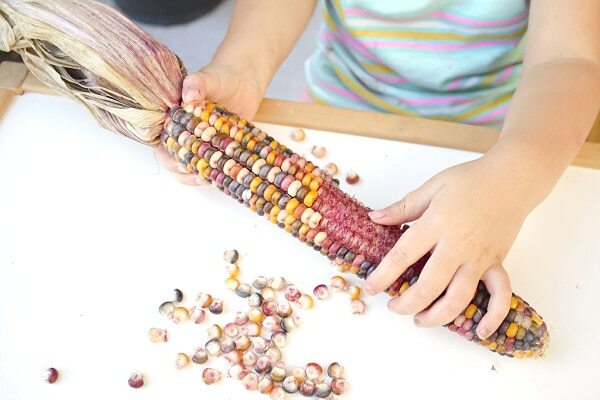 Once you’ve gathered all of your materials, invite children to investigate the Indian corn. Let them examine the corn with a magnifying glass or simply run their fingers along the corn. Take note of the texture, colors, and patterns. We determined that we noticed hues of blue, red, yellow, and some yellowish-orange. 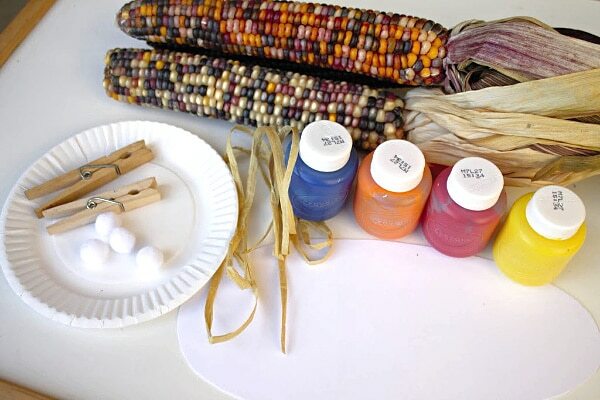 Although Indian Corn is known for its brown, white, and yellow, variegated colors, we chose to work with what we observed. Next, have children remove some of the kernels for use in the math and art project. 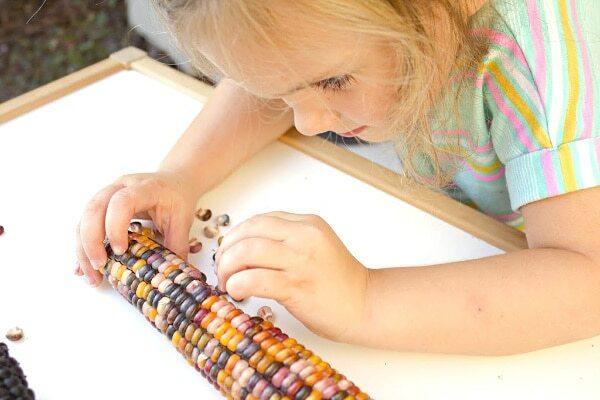 Little fingers will get great fine motor practice as they pinch the kernels off the corn! It may prove a little difficult at first to wiggle the corn off the cob, but with a little help, kids can begin removing it in no time. We really thought it was cool to feel the rough cob beneath the kernels. 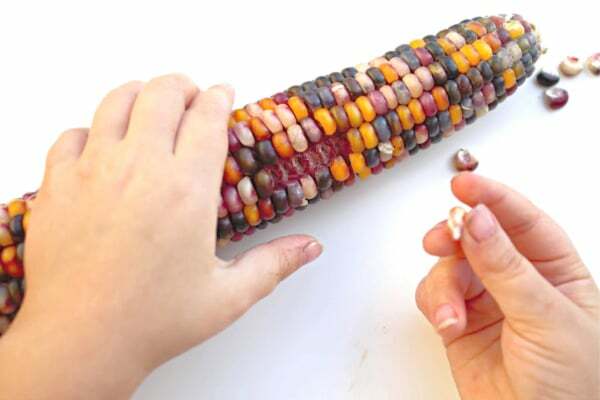 Once some of the Indian corn has been removed, you may begin sorting and creating patterns with it. 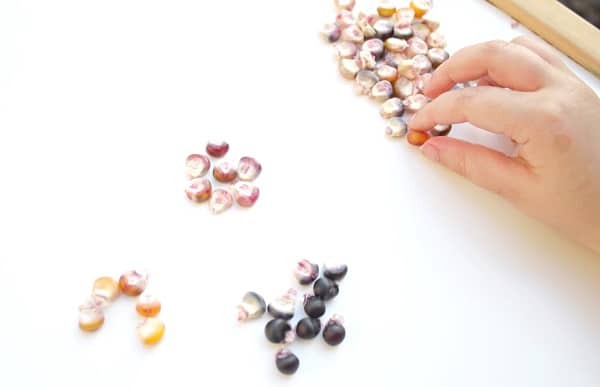 Sorting the colors into similar piles will help in easily choosing colored kernels for patterning. Model simple AB patterns at first and then extend into more challenging AAB or ABC patterns. 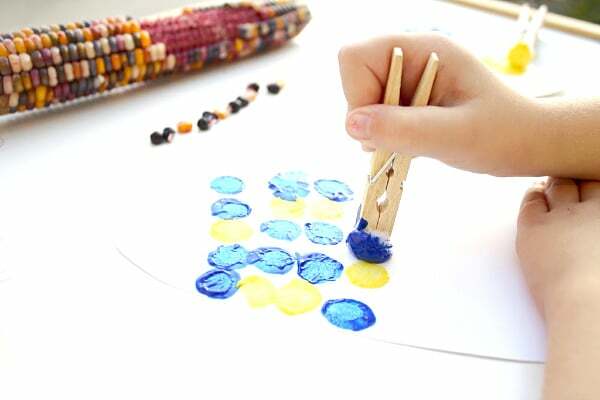 Now it’s time to create some Indian corn art inspired by the patterns created with the real kernels! 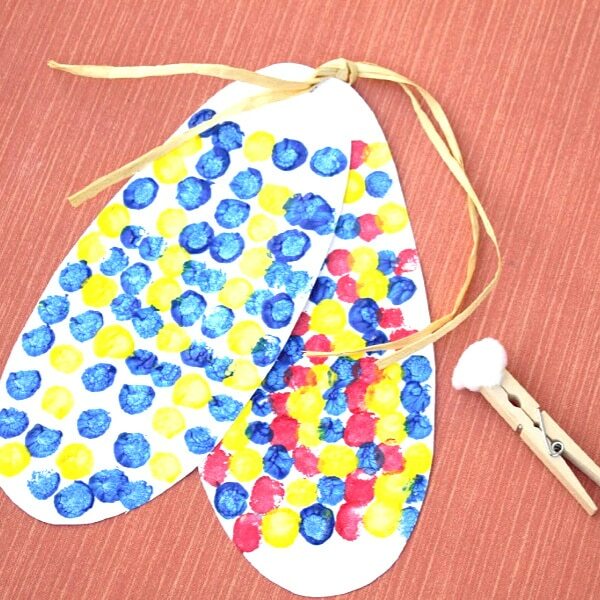 First, demonstrate how to create small kernel looking dots by painting with pom poms. (You know we love painting with pom poms)! 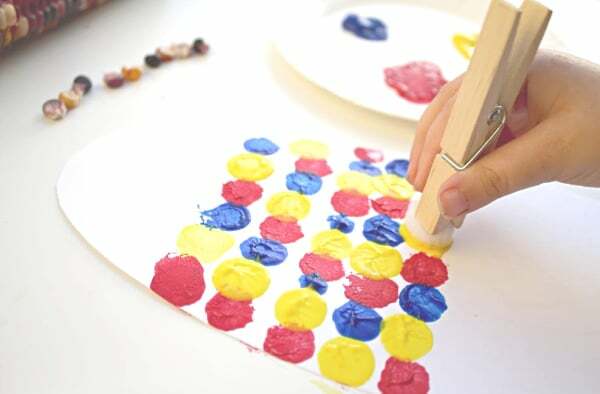 Kids are going to love this alternative painting method! 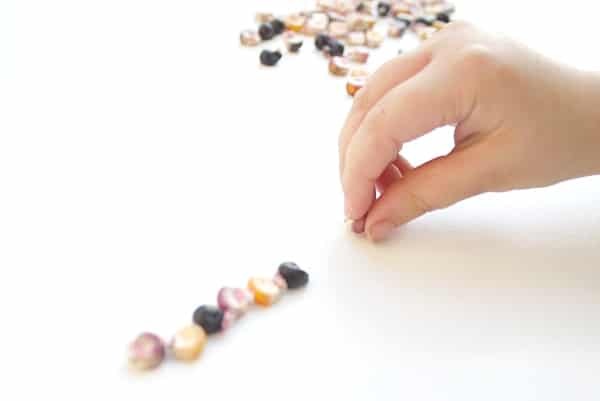 Using the corn kernel patterns as a guide, have children transfer the same patterns they created to their work of art. 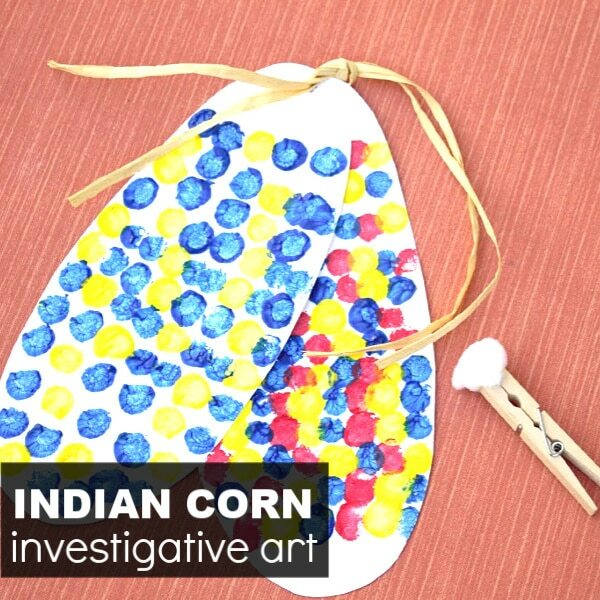 Finish off the Indian Corn art by punching a hole at the top of the husk and tying some raffia or ribbon through. Our beautiful Indian Corn patterned art will remain on our wall throughout the season, serving as a reminder of that first Thanksgiving and the all the Natives did to help the colonists.